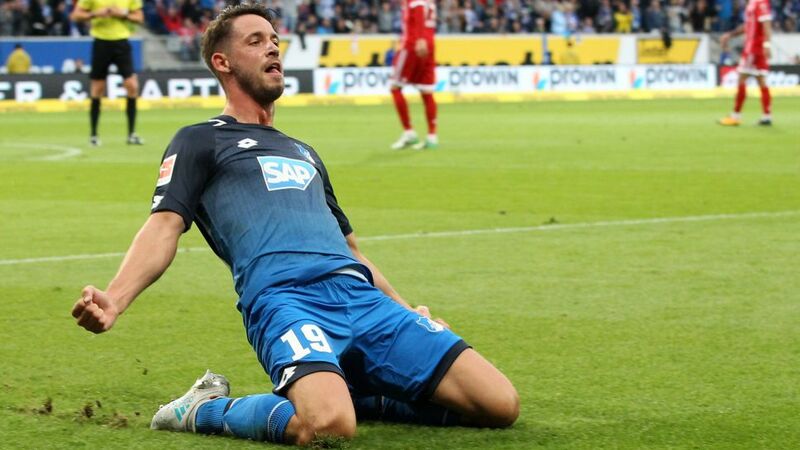 Mark Uth continued his exceptional start to the season with a late goal that helped Hoffenheim come back from two goals down to defeat Mainz on Matchday 5. It’s the type of form that could well end up earning him a place in Germany’s squad for the 2018 World Cup. Recalled to the starting line-up after being rested in Sunday's 1-1 draw with Hertha Berlin, Uth netted Hoffenheim's all-important third goal in second-half stoppage time to earn his side all three points, lifting the Sinsheim club to third in the table behind Borussia Dortmund and Bayern Munich. This was not the first time Uth has found the net at the OPEL ARENA, either. Last season, he helped Julian Nagelsmann's side recover from 4-1 down to draw 4-4 with two second-half goals. After his latest decisive contribution, Sandro Schwarz and his Mainz players will be happy to see the back of the Cologne-born striker. Uth’s winner at Mainz was his fourth goal in five league appearances this season - his best ever start to a league campaign. After netting the equaliser in a 2-2 draw with Bayer Leverkusen on Machday 2, the 26-year-old scored both goals in a highly impressive home win over Bayern Munich, becoming the first Hoffenheim player to score a double against the record champions. That sort of form is the type of thing that gets a player noticed. Uth’s contract with Hoffenheim is due to expire next summer but Nagelsmann reiterated his desire to hold on to the forward after watching him condemn Bayern to their first defeat of the campaign. “You can see that he feels comfortable,” the Hoffenheim boss told Sky Sports Germany. “That’s a big factor for a footballer. Uth netted eight times in his first year back in the Bundesliga, towards the end of which Hoffenheim Director of Football Alexander Rosen declared himself extremely satisfied with his signing. Uth continued to shine last season, although his progress was halted between September and November and February and March due to injuries. The attacker’s vital statistics remained healthy though and he finished with seven goals and three assists in 22 Bundesliga appearances - only 12 of which were starts. “Football has a lot to do with self-confidence,” Uth told kicker last year. He is clearly full of it right now and a tally of five goals in six games this season suggests that his upward trajectory will not stop any time soon.